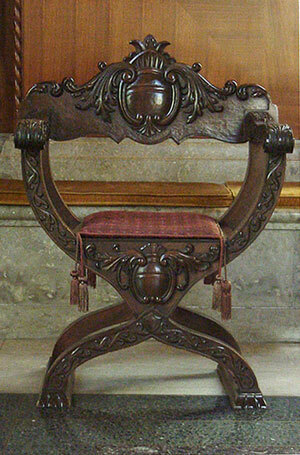 One of six reproduction carved walnut Italian Renaissance-style curule-form chairs made by L. L. Sams and Sons Furniture Co. of Waco, Texas. 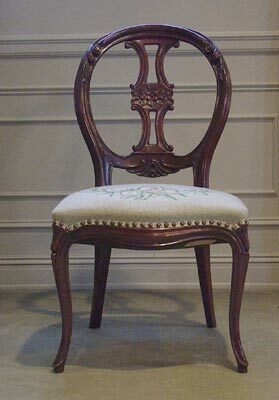 They were all styled after a chair that belonged to Robert Browning, and the six chairs were furnished for the room by Mrs. Marrs McLean of San Antonio. Six side chairs and six arm chairs were made by Vader Tey Brothers, Inc., Grand Rapids, Michigan, and are reputed to be reproductions of chairs once owned by Elizabeth Barrett at 50 Wimpole Street before her marriage. The Guatamala mahogany chairs all feature needlepoint seats decorated in a Bells and Pomegranates pattern designed by Mrs. Howard Dudgeon of Waco, Texas. The needlepoint was executed by The Elizabeth Barrett Browning Needlework Guild of Waco, under the direction of Mrs. A. Baker Duncan. Other members of the guild included: Mrs. L. C. Greer, Mrs. Grier Patton; Mrs. O. M. Weatherby, Mrs. Clay Watson, Mrs. Elliott Breckenbraugh, Mrs. H. U. Woolsey, Lois Smith, Mrs. Joe W. Hale, Mrs. R. Wilson Crosthwait, Mrs. R. G. Nowlin, and Mrs. Joe M. Higgenbotham of Dallas, Texas. The chairs were given by Mrs. Jessica Calhoun Swartz; Carolyn Sue Faulkner of the Dallas Browning Club; Miss Teta Brooks of the Dallas Browning Club; Given in memory of Annie Hardie Held and John Adolph Held by their daughter, Mrs. Ann Adine Johnson; Mrs. Paul Hutson, nee Mary Elizabeth Sanders; Fidelis Class of the First Baptist Church of Waco; Mrs. J. M. Dawson; Lt. Joseph Cook Hester; In honor of Dixie Wood, daughter of Dr. & Mrs. John Paul Wood; Mr. & Mrs. Joe S. Scudder; and the B. J. Adams family for Mrs. B. T. Adams, nee Irene Kitchen. The finish is black laquer over wood trimmed in red tortoise shell. The interior mirrored doors and small drawers, decorated with oil paintings of Biblical scenes in the style of Rubens, may have once housed a family's valuables. The cabinet was given in 1980 in memory of Sue Moore by her sister-in-law, Mrs. I. G. Moore of Ennis, Texas. The rosewood case piano with 80 keys is a fine example of the sort of instrument that would have been familiar to the Brownings. Robert Browning's mother was an accomplished pianist and taught him to love music. That enthusiasm was later conveyed to his own son, Pen. The piano was given to the Library in 1988 by Mr. & Mrs. Howard Johnson of Sallisaw, Oklahoma. Their son, Barrett, oversaw the restoration of the instrument that returned the piano to its original sound quality and beauty. It is often used for musical events in the Library. After a complete restoration in 2001, the rosewood case and actions of this Chickering & Sons square grand piano are in excellent condition. The instrument was a gift of Mrs. Herbert Bell, Laguna Park, Texas. 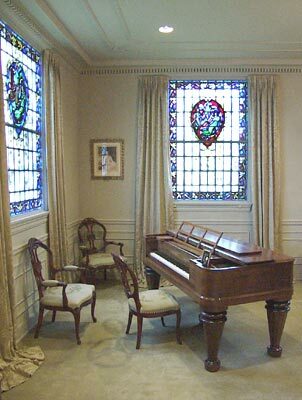 One of two mahogany cabinets specially built to house over 1,500 pieces of sheet music, a collection featuring the Brownings' poetry set to music by many well-known composers. The cabinets are hand-carved with musical motifs, bas-reliefs of the Brownings, and inscriptions pertaining to the donors. The cabinets were created by William A. French Company of Minneapolis, Minnesota. One cabinet was a gift of Friends of the English Department and Former Students and the other was given by Lorraine M. George of Houston, Texas, in memory of his mother, Nettie Rowena George.